When America’s big carriers announced last year that shared data plans were coming, many celebrated. However, now that Verizon has launched shared data and AT&T has announced details, it has become clear that the the end result is a major price increase. Yes, everyone gets unlimited calling and texts, but in the age of the smartphone who cares? At least as far as AT&T and Verizon are concerned (Sprint and T-Mobile have yet to step up), shared data is an opportunity to increase prices. Yes, there are marginal differences between AT&T and Verizon’s plans, but it’s all window dressing. Here’s a real world way to understand what shared data plans really mean — my family has two “dumb” phones and an iPhone with “unlimited” data and our total bill, including tax, with Verizon is $129. 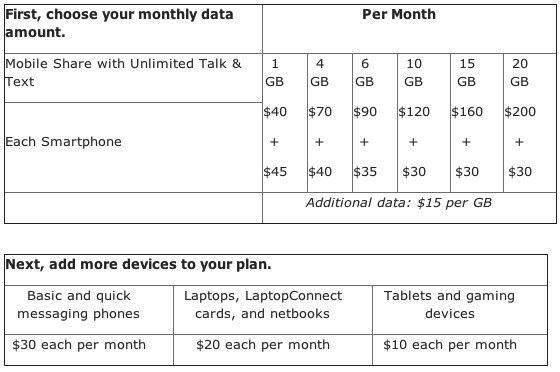 Under Verizon’s new shared data plan, otherwise changing nothing, we would end up paying 2 x $30 (basic) + 1 x $40 (smartphone) + $60 (2GB data) for a pretax total of $160. With tax, the difference between new and old goes up to about $40 a month. For what it’s worth, none of the Verizon or third-party Verizon reseller retail associates I pressed on the question, “Who would pay less?” could provide an example. Yes, shared data is a price increase. Of course, Verizon says that with a shared everything plan we would enjoy unlimited text and calling, but we don’t text and never use the 700 shared minutes under our legacy plan. In nutshell, whether it’s AT&T or Verizion, shared data is all about paying more.